I've always loved the tough, mens-style look of a leather jacket and this one is so chic! Everything from the shoulder detail, to the asymmetrical zips - I love it all. Oh, and can we talk about these boyfriend jeans?! I've been on the hunt for a dark wash, lightly distressed pair and these made my little dreams come true! (I ordered my normal size for a baggy, oversized look, but if you're wanting a more slim fit, I would recommend sizing down one size!) Overall, this look is a little out of the norm for me, but I love mixing leather with feminine touches. I'm totally obsessed with your bag, it's such a classic staple! Looking fantastic in this boyfriend inspired outfit!! Love this look! Those boyfriend jeans are so adorable! Your outfit is amazing, I love your jacket. I love that outfit! Looks so chic! Amazing look! 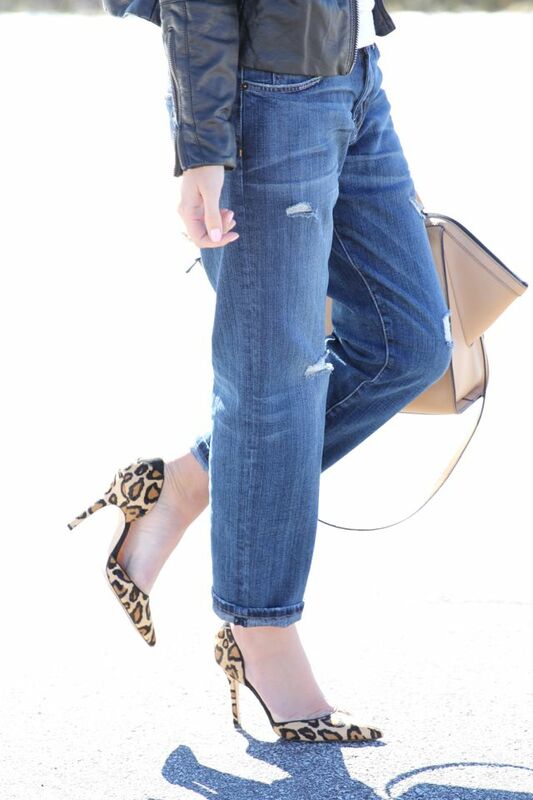 I love the leather jacket paired with leopard pumps.